For other uses, see Scalar (disambiguation). Scalars are real numbers used in linear algebra, as opposed to vectors. This image shows a Euclidean vector. Its coordinates x and y are scalars, as is its length, but v is not a scalar. A scalar is an element of a field which is used to define a vector space. A quantity described by multiple scalars, such as having both direction and magnitude, is called a vector. In linear algebra, real numbers or other elements of a field are called scalars and relate to vectors in a vector space through the operation of scalar multiplication, in which a vector can be multiplied by a number to produce another vector. More generally, a vector space may be defined by using any field instead of real numbers, such as complex numbers. Then the scalars of that vector space will be the elements of the associated field. 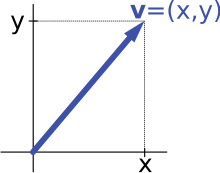 A scalar product operation – not to be confused with scalar multiplication – may be defined on a vector space, allowing two vectors to be multiplied to produce a scalar. A vector space equipped with a scalar product is called an inner product space. The real component of a quaternion is also called its scalar part. The term is also sometimes used informally to mean a vector, matrix, tensor, or other usually "compound" value that is actually reduced to a single component. Thus, for example, the product of a 1×n matrix and an n×1 matrix, which is formally a 1×1 matrix, is often said to be a scalar. The term scalar matrix is used to denote a matrix of the form kI where k is a scalar and I is the identity matrix. Magnitudes that ascend or descend proportionally in keeping with their nature from one kind to another may be called scalar terms.
. In a (linear) function space, kƒ is the function x ↦ k(ƒ(x)). The scalars can be taken from any field, including the rational, algebraic, real, and complex numbers, as well as finite fields. According to a fundamental theorem of linear algebra, every vector space has a basis. It follows that every vector space over a scalar field K is isomorphic to a coordinate vector space where the coordinates are elements of K. For example, every real vector space of dimension n is isomorphic to n-dimensional real space Rn. Alternatively, a vector space V can be equipped with a norm function that assigns to every vector v in V a scalar ||v||. By definition, multiplying v by a scalar k also multiplies its norm by |k|. If ||v|| is interpreted as the length of v, this operation can be described as scaling the length of v by k. A vector space equipped with a norm is called a normed vector space (or normed linear space). The norm is usually defined to be an element of V's scalar field K, which restricts the latter to fields that support the notion of sign. Moreover, if V has dimension 2 or more, K must be closed under square root, as well as the four arithmetic operations; thus the rational numbers Q are excluded, but the surd field is acceptable. For this reason, not every scalar product space is a normed vector space. When the requirement that the set of scalars form a field is relaxed so that it need only form a ring (so that, for example, the division of scalars need not be defined, or the scalars need not be commutative), the resulting more general algebraic structure is called a module. In this case the "scalars" may be complicated objects. For instance, if R is a ring, the vectors of the product space Rn can be made into a module with the n×n matrices with entries from R as the scalars. Another example comes from manifold theory, where the space of sections of the tangent bundle forms a module over the algebra of real functions on the manifold. The scalar multiplication of vector spaces and modules is a special case of scaling, a kind of linear transformation. Operations that apply to a single value at a time. ^ Vieta, Franciscus (1591). In artem analyticem isagoge seorsim excussa ab Opere restitutae mathematicae analyseos, seu Algebra noua [Guide to the analytic art [...] or new algebra] (in Latin). Tours: apud Iametium Mettayer typographum regium. Retrieved 2015-06-24.